The Gateway of India, Mumbai (or Bombay, as it was then), by George Wittet (1878-1926), Consulting Architect to the Government of Bombay. The foundation stone of this iconic and world-famous structure was laid in 1913, and the work on it was completed in 1927. 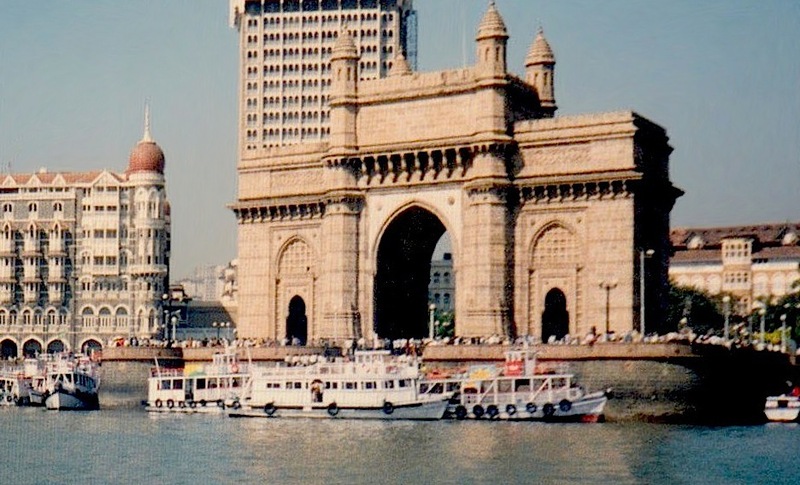 It was built of yellow basalt and concrete on the Apollo Bunder, Mumbai, and commemorates the visit to India of King George and Queen Mary for the 1911 Delhi Durbar (see Morris 194). The temporary domed plaster structure also designed by Wittet for the 1911 visit can be seen behind the canopied pavilion here. The royal couple, having already passed through the plaster arch, are now seated on thrones on a canopied dais. Source: Fortesque, facing p. 108. Wittet had been responsible for the plaster structure through which King George and Queen Mary had passed in 1911, after they disembarked from their ship in 1911, touching Indian soil for the first time (see Chopra 209). The Gateway, built specifically in memory of this occasion was to be a permanent arrival point. Unfortunately, it never included the grand processional way that was meant to lead into the town, a total layout that would have made better sense of its angle here. Unfortunately too, the setting impinges on it. On the left in the main picture is part of the Taj Palace Hotel (an Indian project, though completed by engineer W. A. Chambers in 1903). This is not the problem. But behind it towers the new wing of the hotel, opened in 1973, the Taj Mahal Tower. From this viewpoint, the tower inevitably spoils the view of the Gateway. 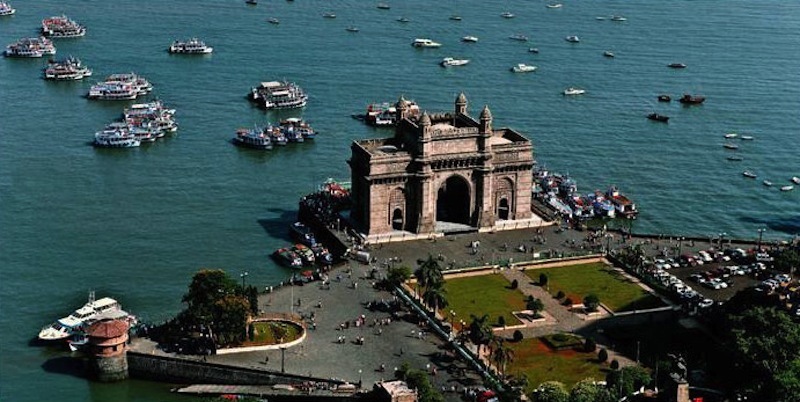 The Gateway of India, aerial view, best seen from the land rather than the sea. As for the Gateway itself, Wittet was not such a "committed Orientalist for public buildings" as Philip Davies suggests (180), but on this occasion he was determined to announce the splendours of the Orient to new arrivals from the west. It had a practical function, too. Preeti Chopra explains that the structure was not just a portal, but "served as a reception hall and consisted of three domed spaces: a central hall with massive arches that formed the gateway, flanked by side halls that could accommodate up to six hundred people" (58). First photograph (1999) and text by Jacqueline Banerjee. You may use this image without prior permission for any scholarly or educational purpose as long as you (1) credit the photographer and (2) link your document to this URL in a web document or cite the Victorian Web in a print one. The last photograph comes from the Government of Maharashtra website, which kindly allows material to be reproduced without requiring specific permission. Chopra, Preeti. A Joint Enterprise: Indian Elites and the Making of British Bombay. Minneapolis: University of Minnesota Press, 2011. Davies, Philip. Splendours of the Raj: British Architecture in India, 1660-1947. London: Penguin, 1987. Fortesque, Sir John. 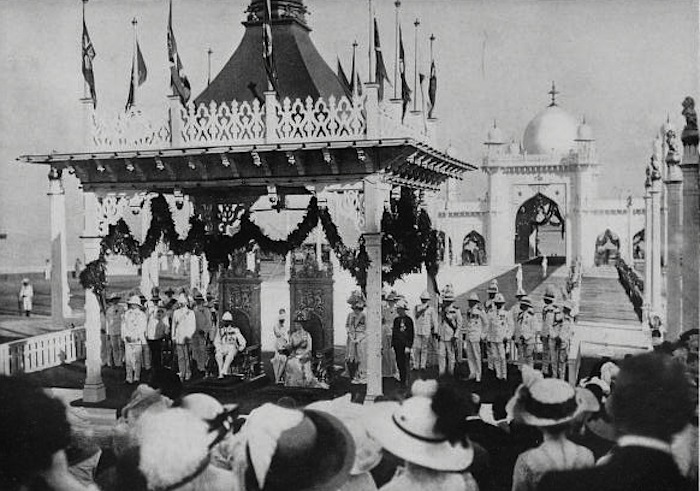 Narrative of the visit to India of Their Majesties, King George V. and Queen Mary, and of the Coronation Durbar Held at Delhi, 12th December, 1911. London : Macmillan, 1912. Internet Archive. Contributed by the University of California Libraries. Web. 14 March 2018. Kamath, M. V. Tides of Time (History of Bombay Port). Mumbiai: Mumbai Port Trust, 2000. Available as a pdf from Mumbai Port Trust website. Web. 14 March 2018. Sheppard, Samuel T. Bombay. Bombay: Times of India Press, 1932. Internet Archive. Digital Library of India. Web. 14 March 2018.